Our signature retreat is dedicated to soothing your 'soles'. Before we even had our name chosen, we knew we wanted to dedicate ourselves to changing the way spas treat feet. A majority people we know suffer from from foot pain at some point in their lives. Either from injury, use, disease, posture, sport, diet or lifestyle. And with over an estimated 7,500 nerve endings in your feet, it is no wonder they can be so painful to stand in and so difficult to medically treat! But at Copper Well Retreat we have found some pretty incredible and effective ways to bring you immediate, and often, lasting relief to many of those challenging conditions such as neuropathy, tendonitis, plantar fasciitis, edema (swelling), achilles tendonitis, gout, rigidity and joint instability. -And we don't just give you a foot massage...we give you a REALLY, REALLY GOOD foot massage. Our signature treatment has already become a favorite among our guests. And with over 280,00 pores and 7,500 nerve endings on the feet, we cannot think of a faster, more effective way to simultaneously detox you while you relax, affecting your entire body! $60 to add 30 min Soak + Massage to a Duet session. How is Foot Soaking such an impactful therapy? The special 4-mineral salt blend we add to the water can reduce edema and inflammation. Magnesium can be absorbed into the tissues to aid the body in rebuilding/repairing torn muscle, tendon and ligament fibers. Once the excess fluid is reduced, the therapist can more effectively reduce pain by following-up massage techniques including Reflexology, Kansa-Vati (brass bowl massage), Hot Stones/Bamboo, Deep-Tissue, IASTM (Stainless Steel tools) or relaxation effleurage. Warm water added to a copper vessel will change the water molecule ionic charge from neutral to positive. 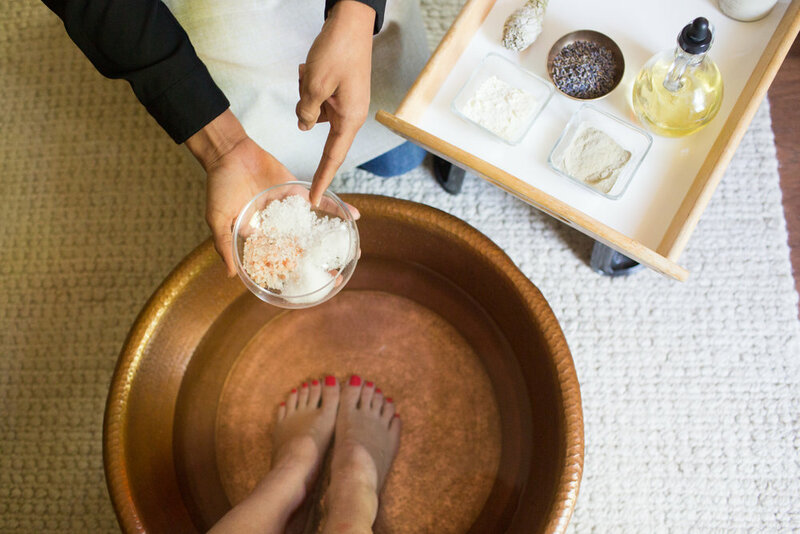 With over 280,000 pores on the bottom of our feet, soaking is a fast way to stimulate the body's natural detox process. Once the feet have cooled, the body will naturally reverse the flow from releasing/detoxing to absorbing. We add a LOT of good thing to your soak to ensure you receive excellent nutrition-YES you can absorb nutrients via your feet! Essential minerals like magnesium and sodium and trace minerals such as zinc, copper and fluoride are included as well as beneficial ingredients such as sea kelp, milk, clay, ginger, lavender, rose oil, grapefruit and many more. 3.) Sedate nerves, increase circulation to lower body & relieve pain from migraine, and respiratory conditions. 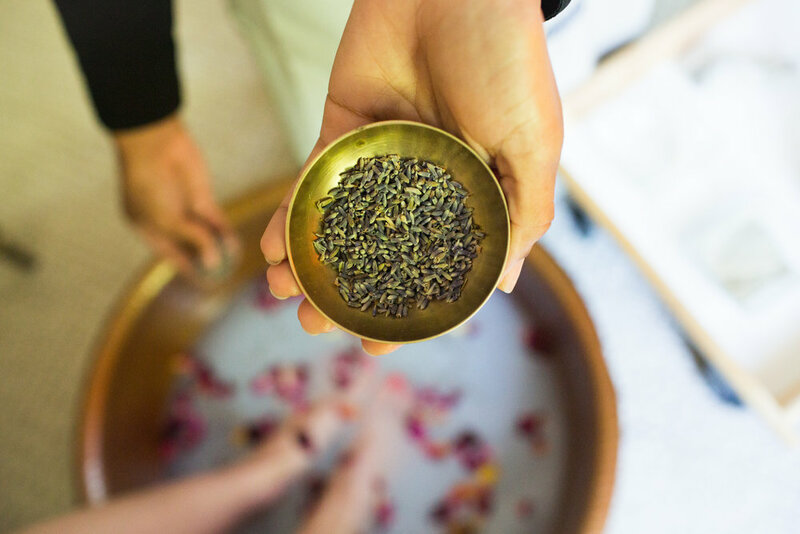 Historically, Headaches, Migraines, Sinus infections, Allergies, Asthma and other respiratory conditions have had a remarkable reduction in symptoms when Foot Soaking therapies were applied. This simple but incredible treatment is often forgotten and overlooked by modern medicine as a first response option to aid the person suffering acute symptoms. It works by quickly pulling blood to the lower extremities of the body. This serves in many ways to reduce symptoms. It can lower blood pressure, and at times even reduce fever (although we do not recommend coming in if you have a current fever). The feet account for 1/4 of all the human body's bones, has over 7,500 nerve endings that correlate to the rest of the entire body, and has over 280,000 pores used to detox and respirate.